Inspired by our historical British Naval uniforms the Hugo & Otto Dartmouth Dog Bed is handmade in a beautiful dark blue, white and red stripe 100% linen fabric by Ian Mankin taken from their iconic Panama Collection. This luxury dog bed is certainly handsome and cosy in every way and designed to make a statement in both contemporary and traditional coastal homes. 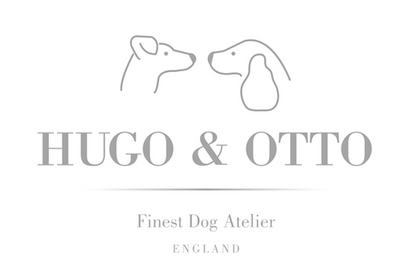 Hugo & Otto offer you design intelligence to every part of this luxury dog bed with the looks and feel of cosy, warm natural linen combined with viscose for practicality. Sumptuous, deep filled mattresses and walls offer your dog cosy comfort and vital spinal support and super great looks for your home. Our background is from interior design and maintaining strong links with historic and new British fabric suppliers is important to our core values. We fine tune our dog products and attention to detail is key, we are truly proud to have Great British Companies to work with and to offer you, your four legged companion and your lifestyle the very best of what we call this Fine British Britishness. Every part of your Dartmouth Dog Bed has been designed for easy living. Each bolster & base mattress is removed individually and so can be washed separately. However, we do recommend that the outer main cover should be washed with the base mattress. Dartmouth Outer Cover: We recommend to wash on a cool wash only 30 degrees. Please dry naturally. Do not tumble dry. Iron on a low heat on the reverse side only. Do not bleach.